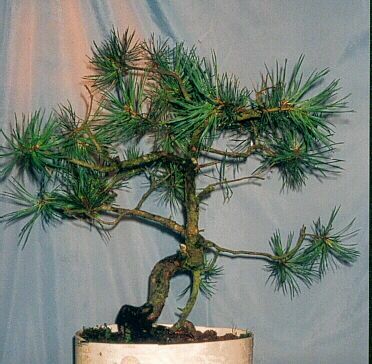 This Scot’s Pine was bought as yamadori back in 1998 from Robert Porch in Scotland. 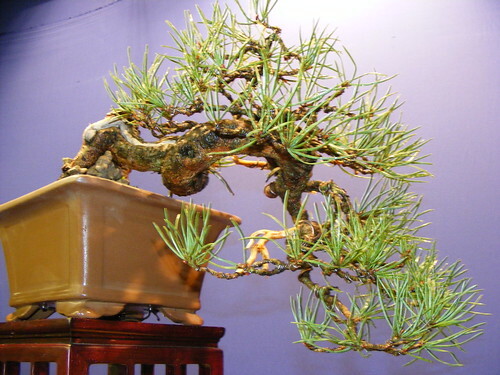 It was well established in it’s pot, as is all Robert’s material before sale. 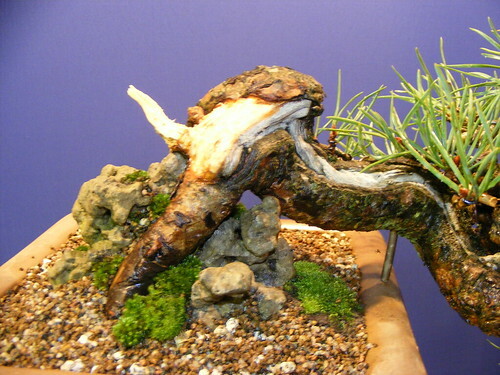 What attracted me to the tree was the quality of the bark and the natural deadwood at the base. The straight section in the centre was always going to require serious bending to create movement. It was given a few years to back bud and increase the amount of foliage on the tree. 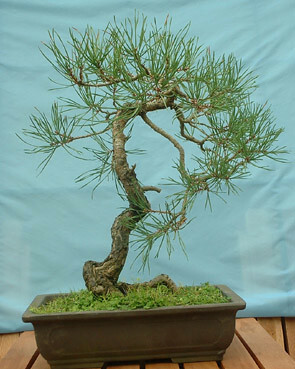 In 2001 the tree was styled for the first time in an upright style. I wasn’t totally happy with this image and continued to look for other options. Sometimes the tree needs to grow and develope for a few years to allow for ideas to come. 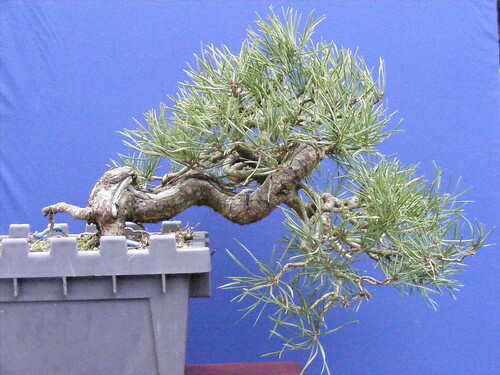 After a few months I had removed a branch or two to tidy up the image. 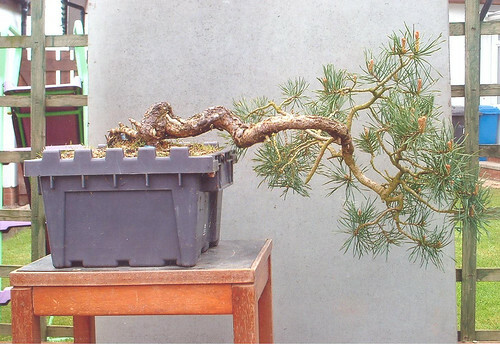 During a one to one workshop with Robert Porch, we looked at all the possibilities for the tree. I think we came up with eight! Robert suggested a cascade would allow the base of the tree to become more of a feature and I opted for this future design. Tilted to possible new angle. 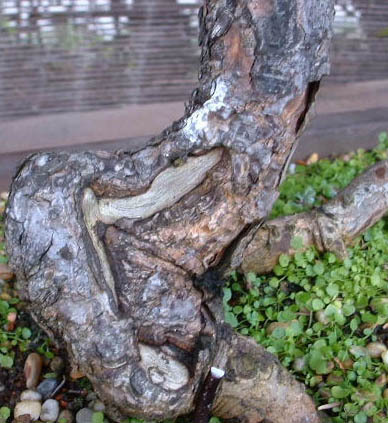 Below is a close up of the natural deadwood at the base of the tree. 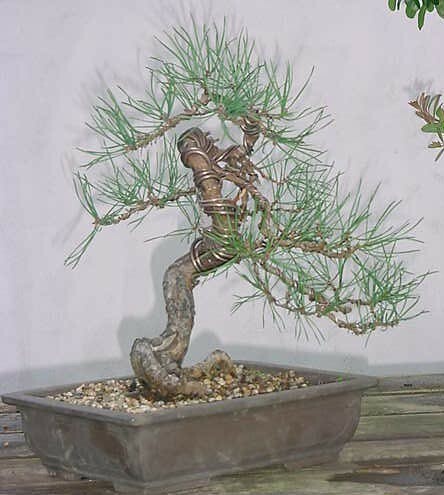 In September 2002 the tree was well established in it’s training pot and the wire from the previous styling had been removed a few months before. It was time to take the plunge and change the image to a cascade. The trunk required some major bending and raffia was applied to protect it. Guy lines were used to help create sharper bends. 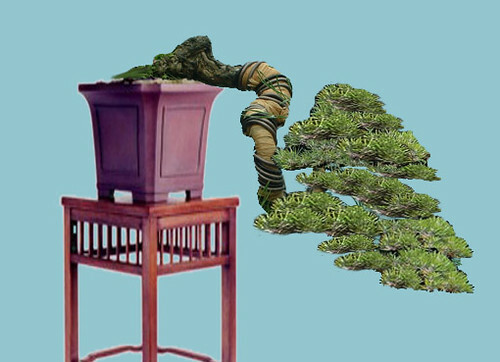 One of the possible future images for the tree was created in a virtual for discussion on the Internet Bonsai Forum at that time. 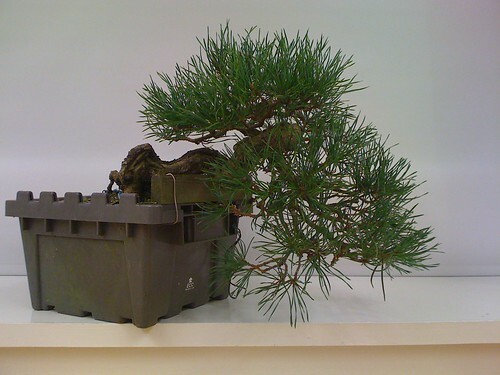 The tree was left alone for a year and was repotted in 2003 into a cascade training pot / Plastic bucket!! 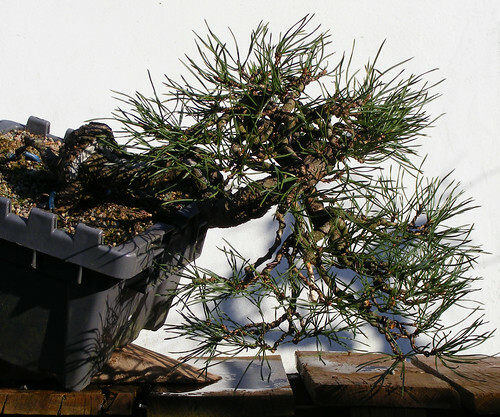 In 2004 the wire was removed and the main trunk line sprang back losing some of the intended bends that had been created in the last styling. Even though the wire had been on the tree for a year, it resorted to memory and tried to return to it’s original shape. Springing back after wire removal. 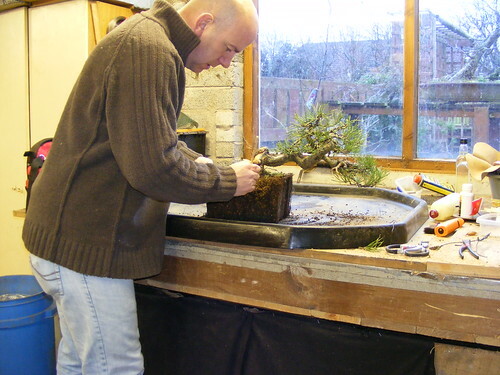 During 2004 the Northern Ireland Bonsai Society had the pleasure of having Marco Invernizzi over for a few days holding workshops. 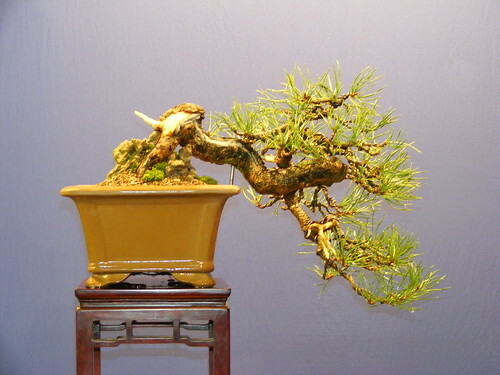 I decided to use the pine as one of my trees. 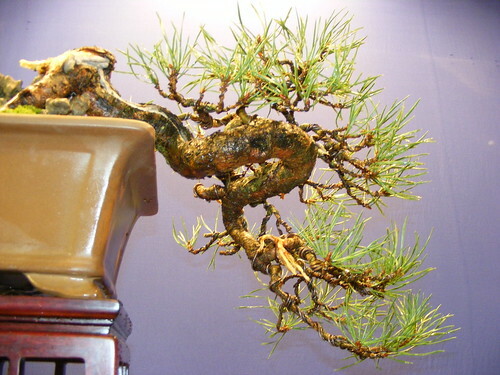 Marco stated that this tree would always try and return to it’s original shape unless measured were taken. 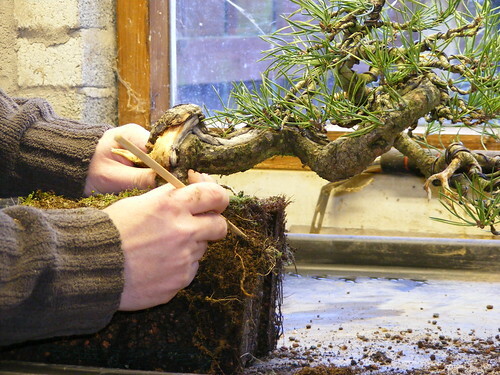 He suggested that we extend the deadwood area at the base along the trunk line that had to be bent again. 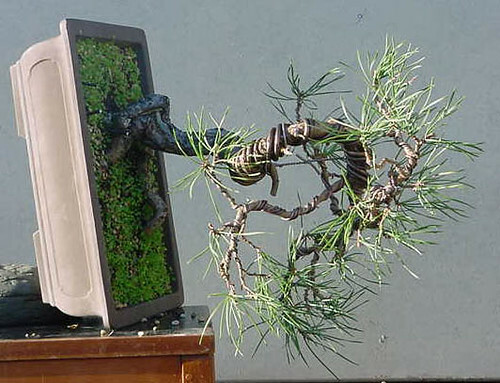 By doing this and then bending, it would help set the tree permanently into its new position. Shari extended and trunk shaped again. Over the next few years the tree was rewired and further tweaks made to the trunk line. AS the image filled, superfluous branched where removed. 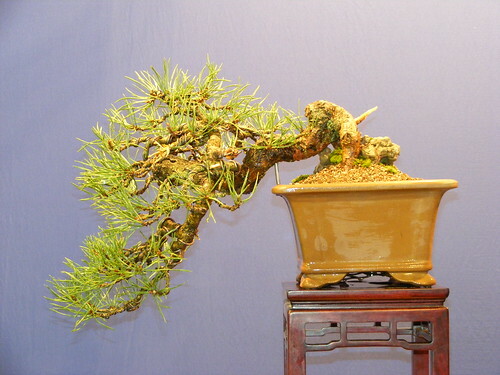 One of the main problems were two aerial roots that wouldn’t fit the new projected potting angle. These however were major feeding roots for the tree. After one years solid growth, I cut halfway through the first root cutting down the sap supply for that area. The following year I then removed it completely. I then repeated the process over the next two years with the other root, except this time I left part of it to be jinned as part of the design. In November I restyled the tree removed further branches as the amount of foliage was getting very heavy. 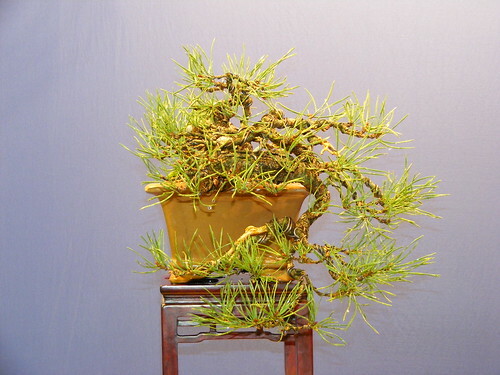 I had been on the lookout for a more suitable pot for the Pine for a few years but pots were hard to come by. 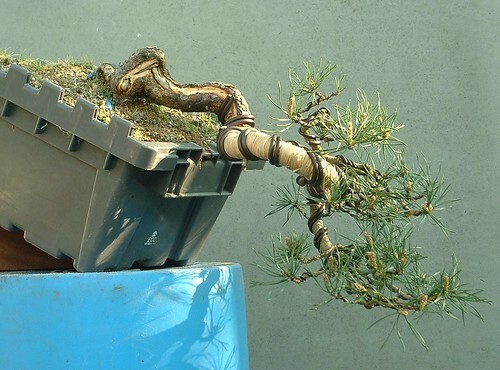 Peter Snart of Willowbog Bonsai came to my rescue with a pot. 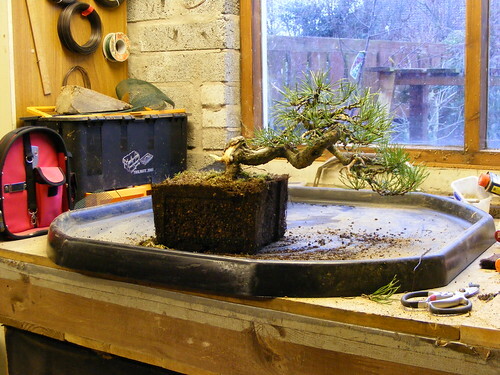 It isn’t the ideal pot but, as the tree has many years to go yet, I’m in no rush! 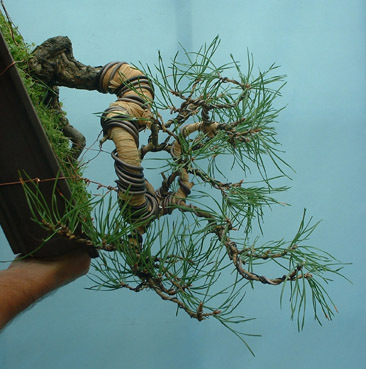 This is the tree wired and styled roughly before repotting it a month later. I removed it from it’s pot and was disappointed not to see more Myselium fungus growing in the mix. This helps the tree break down the nutrients in the soil for uptake by the tree. As the tree has been a vigorous grower for years I wasn’t overly worried though. One of the other concerns I had was actually getting the tree to fit in it’s new home. 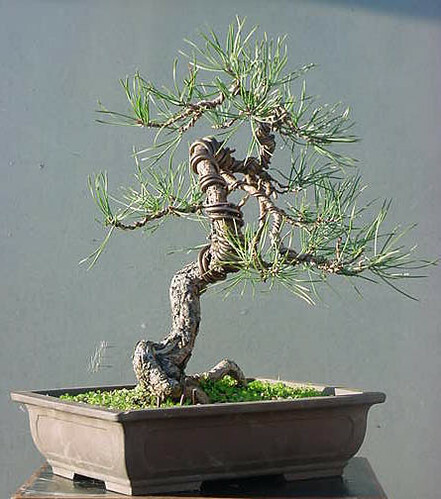 It’s root system stems from two main roots which make it ackward to fit the tree into the pot at the right angle and depth. I there had to make a few adjustment to my proposed angle choice for the health of the tree. I removed as little root as possible in the process. This left me with a rather unsightly gap between the roots at the soil surface. I decided to fix this by placing some good old Irish Mud Rock into the gap. I’m not a big fan of this in most cases, but in this instance, I think it works. New Front and potting angle. 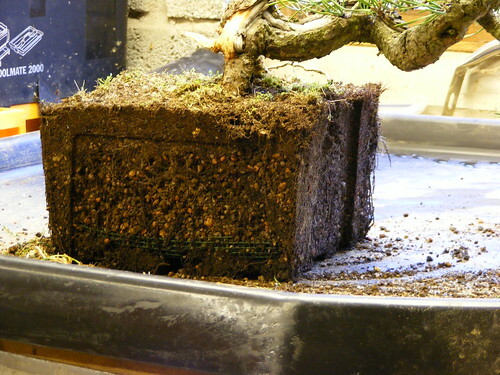 Below is a Flash 360 degree of the tree after repotting. Just place your pointer over the image and spin it around for a closer look. 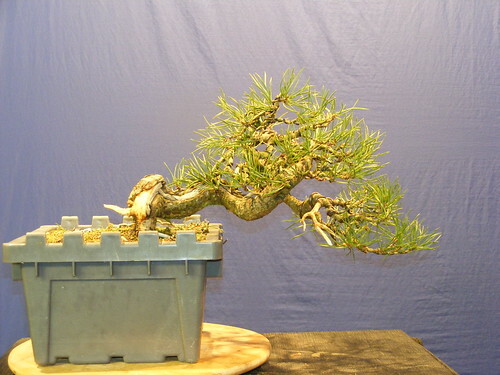 Here are a few shots taken from below to help show the movement in the trunk line and branch placement. A close up of the mud rock added around the roots to disguise the gap. I hope you have enjoyed viewing this page and be sure to check back for updates as the tree progresses next year. Below is a video showing the trees progression so far. Enjoy.